Pink house is situated between Arco da Calheta and Loreto with a fantastic view over Arco da Calheta. The house has been nicely decorated inside,and outside with a big an relaxing terrace with a lovely view above the ocean. 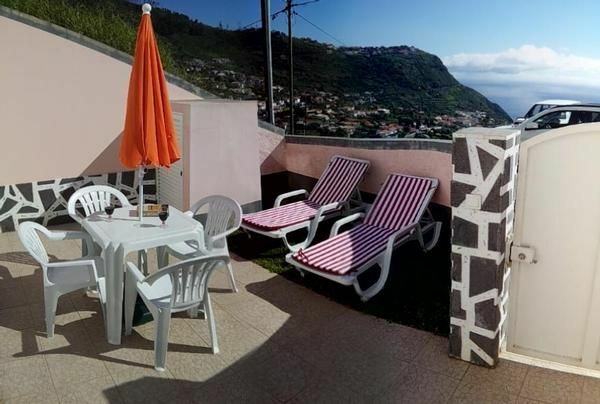 The house has 2 bedroom,one with a double bed and the other with two single beds and both rooms have big windows with views over Arco da Calheta and the ocean.All the windows have blinds for a better control of light. The ceilings on the bedrooms have got a nice geometry.The double bedroom has a private balcony and for easyness and comfort there is a batroom fully fitted with shower\bath,bidet,basin.The kitchen is well equipped with gas hob,fridge/freezer,microwave,coffee maker, toaster,sandwich maker,kettle,blender and washing machine.The living room is beautiful and modern.It has satellite tv with a big plasma screen,dvd player and sound system.There is a nice terrace with a table for four, parasol and 2 sun beds, a nice garden and barbecue area.The property has private parking.